Surrey Sounds started broadcasting in September 1982 to N Surrey on Saturday afternoons. Amongst the team were several people who had previously been involved in DDP Radio which had broadcast to the same area from 1980 to early '82. The original 10w DDP transmitter was used for the new station, however it was boosted to 60w using a new amplifier. A stereo coder was also added. A 'slim jim' aerial was permanently installed at the top of a tree near to Epsom Racecourse. From there Surrey Sounds put out a signal which not only covered the intended N Surrey area, but the site was high up at the edge of the London Basin, and consequently the signal could be heard throughout most of London. 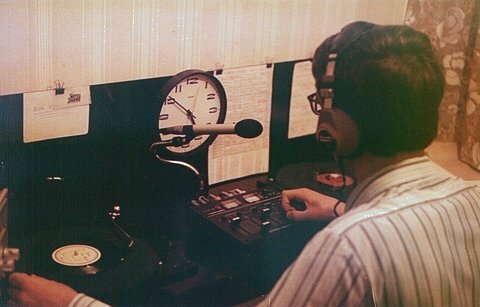 The DJs included Rob James, Steve Day, Roger Hall and Martin Hill who all pre-recorded their programmes prior to the broadcast. After several months of successful broadcasts the station was raided in March 1983, and put off the air permanently. Steve Day managed to escape, but Rob James and Martin Hill were both prosecuted under the 1949 Wireless Telegraphy Act. The team continued to run the Surrey Sounds roadshow - a mobile disco - until 1992.